Things I Learned From: The Happiness Project — Robin Reetz Second Floor Flat follows an American expat who lives in London and works as a magazine journalist. I’m halfway through reading a book that I was initially embarrassed to buy. My mom and I spent a rainy afternoon at a Waterstone’s when she was here, and when I brought the book over to show her I immediately felt like I needed to explain myself. I have no problem with self-help-type books of any kind (whatever works), and also this is my mom, so why the immediate defensiveness? 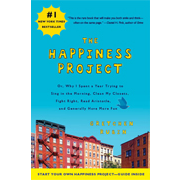 Something about a book called The Happiness Project just makes me feel like I need to explain myself. Social stigmas, probably? Whatever. Either way, so far so good—the book has realistic advice on small things that you can actually do everyday that help to make you feel less annoyed, more grateful, etc. 2. Complaining or speaking negatively about something actually makes you feel bad. Try stopping yourself before your next rant and you’ll see what I mean. 3. Men and women find relationships with women to be more enjoyable than those with men. The most reliable predictor of not being lonely is the amount of contact a person has with women. In other words—hang out with your girlfriends, your mom, your female cat, whoever. If you have a sister, even better. I’m also happy to report that the author is just as much of an organizational nerd as I am. She has a revelation in the book based on filing boxes, and I was glad to dog-ear this page. Srsly, even if you think it sounds cheesy, small things make a big difference. My sister and I are both convinced that the secret to a fulfilled life is making your bed first thing every morning. You would be amazed at the impact it has on you, whether you realize it or not.